We think Nova Scotia is a marvelous place to live, but, understandably, you have a lot of questions about this place you are considering making your new home or home-away-from home. Read on to find the answers to the most frequently asked questions about Nova Scotia. If we haven't covered your concern or query, please Contact Us. Where in the world is Nova Scotia anyway? What does Nova Scotia look like? What is the population Nova Scotia? Is it cold all year in Nova Scotia? What is it like to work and live in Nova Scotia? How difficult is it to buy property in Nova Scotia? If I do buy property in Nova Scotia, how often can I visit it? What happens if I decide I'd like to move permanently to Nova Scotia? What's the best time of year to look at properties in Nova Scotia? What other reasons are there for wanting to live in Nova Scotia? If I decide to purchase property in Nova Scotia, why should I work with Tradewinds Realty? Not too far, not too close, but far enough so that when you get here you know you're somewhere very different and very special. 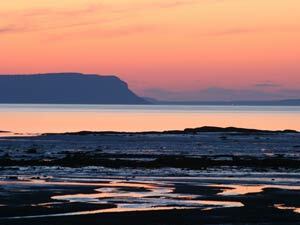 Located on the east coast of Canada and mainland North America between Maine and Newfoundland. 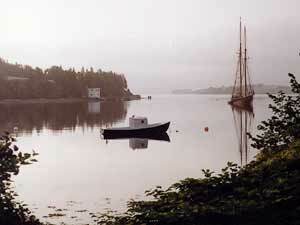 Nova Scotia is a peninsula and almost completely surrounded by ocean. Hence, we are sufficiently isolated from the rest of North America to ensure that you can maintain the quiet, peaceful lifestyle that many like you are looking for when they first visit us or decide to reside here. Roughly four to six hours flying time from London or Western Europe, or about two hours from New York City or Toronto puts you down at Halifax's Stanfield International Airport. From there, it's no more than a four hour drive to the most distant parts of Nova Scotia and only an hour to Chester or 1 1/4 hours to Lunenburg. The airport is big, modern, and offers the arriving traveller many amenities (including a well-stocked liquor store and the first opportunity you will have to buy fresh or cooked lobster for dinner). For U.S. visitors, Halifax Stanfield International now offers the convenience of U.S. Customs and Immigration pre-clearance before departure for the U.S. We are also easily accessible by car via the Trans-Canada Highway. For those who wish to know precisely where they are at all times, Nova Scotia's coordinates are latitude 43° to 48° North and longitude 59° to 67° West. We pretty much have our own time zone too (sharing it only with the other two Maritime provinces and most of Labrador). When it's 12:00 Noon in Nova Scotia, it's 11:00 AM in Toronto, New York and Miami, 10:00 AM in Chicago and 8:00 AM in British Columbia, California and Nevada. In the other direction, it's 4:00 PM in London and 5: PM in Rome. Finally, when the sun rises over Nova Scotia every morning, the only people who have seen it earlier than we have, live on the east coast of Newfoundland. That way, we like to think that we've already got a good start on the day when those west of us are still rubbing the sleep out of their eyes. Technically, it's a peninsula connected to the rest of Canada by a 17 mile (28 kilometer) wide neck of land called the Isthmus of Chignecto. Except for that little narrow strip of land, we are completely surrounded by the Atlantic Ocean. Think of the State of Maine. Lots of ocean coastline, right? Right, 228 miles of it, in fact. California has more coastline - 840 miles. Florida has the most of any State - 1,350 miles of Atlantic Ocean and Gulf of Mexico coastline. It's a peninsula too. Nova Scotia's coastline is littered with bays, coves, basins and harbours galore and it results in our small province (roughly double the area of Massachusetts) having a whopping total of 4,630 miles (7,500 kilometers) of ever-changing continuous coastline. It includes every geographic cliché in the book - spectacular sandy beaches with crashing surf, calm bays and inlets protected by offshore islands, soaring cliffs and ragged headlands with shores littered by giant boulders. 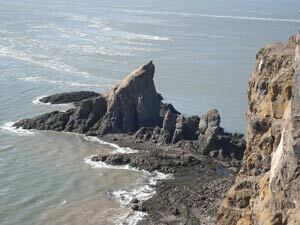 Nova Scotia also has coastline on the Bay of Fundy which has among the highest tides in the world. Indeed, the ebb and flow of the tides of the Atlantic Ocean has dominated our scenery and our way of life since Europeans first settled here four or five centuries ago. It still does today. 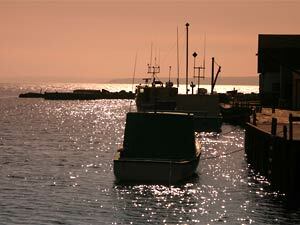 Nova Scotia isn't just ocean coastline, however, although that's where most of us live. It is also seemingly endless tracts of forest, shimmering lakes, rolling farmland and breath-taking highlands every bit as dramatic as those of Scotland. Many of our highways and byways take advantage of the scenery as do thousands of privately-owned properties. 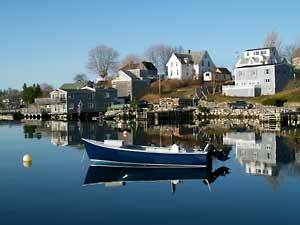 With tiny villages, picturesque towns and several urban centers, Nova Scotia offers a diverse landscape and plenty of room for everyone. Over 950,000 people now call Nova Scotia home. Mostly, we spread ourselves out pretty well although, historically, most settlement occurred along the extensive coastline of the province. As a result, great expanses of the forested interior remain sparsely populated except for summer cottages on some of our numerous fresh water lakes. When you calculate the average number of people in Nova Scotia per square kilometre, the number turns out to be only 17.7 (or 10.6 per square mile, if you prefer). That compares with an average of almost 3,000 people per square kilometre (or 1,800 per square mile) in New York City. (That's high population density!) 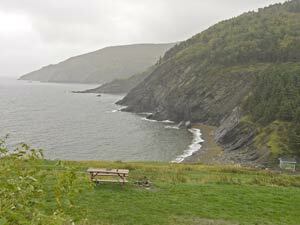 In much of Nova Scotia, if you sat perfectly still somewhere all day long, you might never see a soul. Nova Scotia has been greeting newcomers since the early 1600s when explorers from the Old World took home tales of the abundant cod fishery. First came the French, closely followed by the British - there are magnificent monuments to their warring presence in the partial reconstruction of the imposing French bastion, Fortress Louisbourg (in Cape Breton) and the British military landmark, Citadel Hill (in Halifax). They were followed by successive waves of immigrants from Germany, Switzerland, Scotland (Gaelic is still spoken in parts of Cape Breton), and Ireland. Americans have been dropping in to visit or settle in Nova Scotia for over two centuries, and following the U.S. War of Independence, many of those whose loyalties belonged to Great Britain immigrated to Canada as "United Empire Loyalists". All have left their marks in Nova Scotia - none more eloquently than the immigrant Germans who built the "old town" area of the Town of Lunenburg, this well-preserved area having recently been designated a "World Heritage Site" by UNESCO. Over the years, many seafaring Nova Scotians did some migrating of their own and, as a result, people with Nova Scotian roots are not uncommon in many New England States, Western Canada and, subsequent to the "Acadian expulsion"* by British forces in 1783, in Louisiana. Definitely not. Our summers are usually beautiful with our average daily temperatures being in the 70s Fahrenheit (or the low 20s Celsius). The table below shows the average daily maximums and minimums at the Halifax Citadel for each month of the year, but temperatures can vary quite a bit depending on where you are in Nova Scotia. Generally, it's cooler on the coast and warmer inland, with gentle ocean breezes making it comfortable day and night. However, our weather can be variable. You'll probably hear this old Nova Scotia joke more than once when you visit... "Don't like the weather? Wait 10 minutes; it'll change." Our motor vehicle license plates carry the slogan, "Canada's ocean playground". 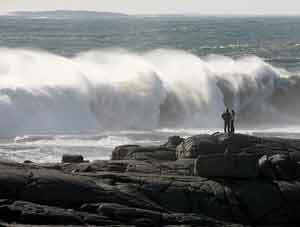 Nova Scotians owe a lot to the Atlantic Ocean - especially their climate. Fog? Sure, it comes in at sunset and it goes out in the morning, especially through the late spring and early summer, but by mid-July, you can't find a nicer place to be. Warm days, clear skies, and stiff breezes make Nova Scotia a sailor's, painter's or photographer's paradise in the autumn, which lingers on and on. The Gulf Stream (a warm water ocean current that heads north off our east coast) keeps our winters particularly mild compared to other parts of Canada and the northeastern U.S. Inland, snowfalls are moderate to heavy, with coastal areas often getting rain or a snow/rain mixture. Of course, we occasionally get "clobbered" by weather systems called Nor'easters. These are winter storms that barrel up the Atlantic Coast of the U.S., picking up moisture from the Atlantic and dumping it on us as snow. Fortunately, they're usually followed by rain and/or mild weather from the southern U.S., so it doesn't take us long to "dig out". Traditionally, many people have made their livings either directly or indirectly from the fishery. Today, as one industry declines, others help fill the void. Tourism takes full advantage of all the beauty and pleasures of our coastal land. The addition of forestry, agriculture and, more recently, the offshore oil and natural gas industry to the economic mix means Nova Scotians work hard but generally live comfortable lives. 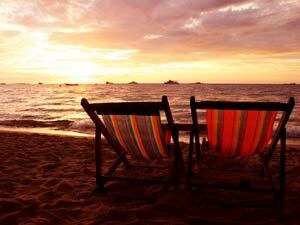 With the convenience of present-day world-wide Internet and other communications, many newcomers find this to be the ideal place from which to conduct their businesses, while indulging in our "laid back" lifestyle that had first attracted their attention. Nova Scotians are proud of their culture and heritage, and it shows. Musicians and artisans seem to appear around every corner, with each area of the province having its own local flavour. Community suppers and teas are a way of life here - from maple syrup breakfasts to strawberry socials to "Mackerel Snappers" picnics and church suppers featuring everything from turkey, baked ham to steamed lobster with all the trimmings. We also have many fine restaurants where, if you don't like fish, you can sample another famed Nova Scotian delicacy, Black Angus beef. Ask for it. It's not difficult at all. There are no restrictions of any kind on the number, size or type of properties in Nova Scotia that can be purchased by non-residents. 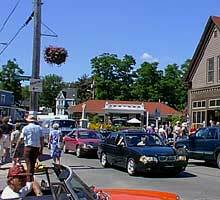 Expect to pay fair market prices relative to the popularity of the area you are shopping in. You'll be pleased to know that "Come-From-Aways" (as we fondly refer to those among us who are not born and bred here) can get bank financing - usually up to 50 - 60% of the purchase value - for property purchases. Our currency is the Canadian dollar which is still offering excellent value to people converting to it from other currencies. See how many Canadian dollars your currency will buy today. More important, however, is the perception widely reported to us by non-resident property buyers from America or Western Europe and the U.K. that Nova Scotia real estate is "still very affordable". Some say that oceanfront property in the New England area is priced as much as two or three times higher than comparable properties in coastal Nova Scotia. British buyers often characterize the value of our real estate offerings as representing "real bargains" compared to prices for comparable properties in the U.K.
All you need do is to select a real estate agent/Realtor who works in the geographical area that is of interest to you (we have over 40 of them at present providing province-wide coverage, so hopefully it will be one of them), get in touch with him/her by e-mail or telephone, and set up a date to meet. If you purchase, you will also require the services of a Nova Scotia lawyer/solicitor and (if you are purchasing a house) the services of a licensed home inspector to aid you in evaluating the condition of the building and its electrical, heating and other systems. Your Realtor will supply you with several names of practitioners in each field who have served our other clients well in the past. Pretty much as often as you like. Actually, Canada Customs & Immigration says that you can stay in Canada for a total of up to six months during each calendar year. Any more than that will require that you apply for an extension. Many non-resident property owners come to visit their Nova Scotia property once a year and spend "the summer" here, say mid-June to mid-October or later. That way, they get to enjoy our moderate summer and autumn seasons. They also bring their dog and cat - the only requirements being that their owner accompanies them and that they have up-to-date vaccination papers with them for each pet. Be sure you bring a valid Passport to expedite your own entry. Entering "Immigrating to Nova Scotia" on www.google.ca or another search engine of your choice will give you links to immigration lawyers, economic development agencies in Nova Scotia, and the history of immigration to Nova Scotia - over 1,000,000 links in all. Almost any time. Let us know you're coming and we'll be waiting for you! The best time to visit Nova Scotia as a prospective property buyer is during the season(s) during which you plan to spend the most time here. That said, the weather is pleasant for looking from about mid-spring until early winter (December at least). Peak tourist season runs from June through September. While visiting Nova Scotia, plan to make the most of your time and take in our many year-round visitor sites and activities. Visit Nova Scotia's official tourism website, www.novascotia.com, click on "Plan" on the Home page and be sure to order the free "Doers' and Dreamers' Guide". It's packed with everything you'd like to know before "setting sail" to Nova Scotia. If you're in a rush, be sure to pick one up at the Tourism Information Centre when you enter Nova Scotia at Amherst (by car), at Yarmouth or Digby (by car ferry) or Halifax's Stanfield International Airport. If you're planning to visit Tradewinds Realty Inc. in Chester, N.S., you'll find us on Nova Scotia's "Lighthouse Route" heading south-west from Halifax on the tourist map on the inside cover of "Doers' and Dreamers' Guide". You've already read the statistics and details about what makes Nova Scotia a near perfect place to live. But here are a few more reasons that our clients who have moved here also consider important. You may too.Low crime rates. 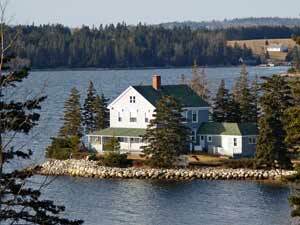 Singers Anne Murray, Rita MacNeil, Hank Snow and actor Donald Sutherland all grew up here. 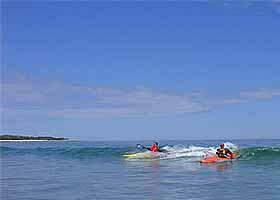 Nova Scotia has some of the warmest ocean beach waters north of Virginia. Noticeably lower air pollution than in almost any city elsewhere. The entire communications infrastructure of a large country (3 national TV channels, cable, high speed internet) at a small town pace. Communities and even urban neighbourhoods are small enough (and the people friendly enough) that you quickly get to know your neighbours. Little or none of the pressures of daily life in a big city. Our largest city, Halifax, has a population of only 370,000 and the whole province has fewer than 1,000,000 residents. From Chester, you have to drive at highway speeds for 25 minutes before you encounter a town big enough to have traffic lights at intersections. There is a strong sense of community everywhere in Nova Scotia. Plenty of people volunteer their services to a multitude of worthy causes without hesitation. 1. All Nova Scotia real estate agents are licensed to sell real estate anywhere in the province. However, most work in a 20 or 30 km. radius of where they live. No-one can pretend to be knowledgeable about listings and market conditions in industrial Cape Breton, for example, if they work out of an office in Chester (a 5 hour drive each way). Until recently, real estate brokerages were confined to working in the areas where they had offices and resident agents. Tradewinds Realty eliminated this barrier to province-wide coverage by creating a new category of real estate agent - the "online agent". Tradewinds Realty created an intranet (iTradewinds) through which "online" Tradewinds agents can access all the vital listing documents (deed, property surveys, Property Condition Disclosure Statements from sellers, etc.) that were previously accessible only from the office files. Now, a Tradewinds real estate agent residing and working in Cape Breton can access all of the information he needs electronically from our Head Office in Chester via our intranet without leaving his home office. 2. Tradewinds Realty now has over 40 full-time and highly productive agents living and working in all of the key market areas of Nova Scotia. They have strong local market knowledge and expertise, and you can access any of them at any time. For example, should you spend a few weeks scouting out properties in the Annapolis Valley without success, we can reassign you to one of our agents in the new area of interest and pass on our knowledge of your requirements that we have acquired in working with you in the Valley. The new agent will know what you are looking for and will likely have some properties to show you on arrival - not just Tradewinds listings either. Provided they are MLS listings (and virtually all are), we can show you the best of what our competitors have listed and arrange for you to purchase it at no extra cost to you whatever. To our knowledge, no other Nova Scotia real estate brokerage has copied our intranet/online agent innovation. Perhaps they don't have the technical expertise to create a secure intranet for the transmission of highly confidential documents. Or, they may have noticed that we have been recruiting some of the most senior and productive agents in the province, including a few of theirs, perhaps. Maybe they're still wondering what hit them. 3. Tradewinds Realty is widely acknowledged as having one of the most informative, up to date and user friendly real estate brokerage website in the business - anywhere. It's probably one of the key reasons why you're considering working with us right now. 4. If you've searched our more than 500 current property listings by location or price range without finding one you might want to purchase, we can keep you updated weekly on all of our new listings taken during the past seven days. All you have to do is subscribe to our free "weekly e-mail update" showing all of our new listings for the previous seven days. You would be among the first to know about that perfect property that just came on the market. At present, over three thousand potential buyers from all over the world are doing just that. 5. Finally, the Tradewinds agent assigned to work with you will provide you with a list of MLS numbers of other brokerages' new listings on a daily basis that appear to meet your requirements, and you can check them out on www.mls.ca. If the limited MLS site information is interesting, we will provide you with the complete listing description from Filogix, the company that collects all property listing information from all brokerages and prepares an abstract for www.mls.ca. That way, you will be kept fully abreast of all new listings in those parts of Nova Scotia that have excited your interest, and you will only have to deal with one agent in each location. It's a good use of your time and it has proven highly successful for us!